John and Toni were in love. 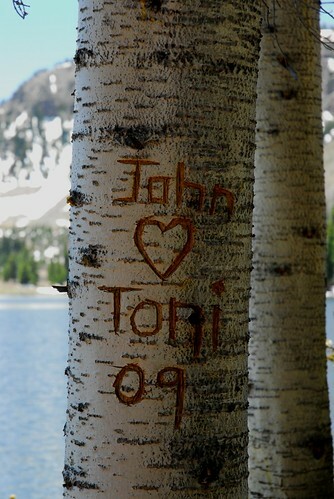 At least they were when they carved their names on an Aspen tree back in ’09. I found the tree while I was hiking around a mountain lake high up in the San Juan Mountains, the same lake where I took my newly-wedded bride on our honeymoon 26 years ago. Back then we didn’t carve our names into any tree. We just took photographs of the beautiful lake and enjoyed the freedom of beginning our very own adventure. Poage Lake is not hard to get to. Just drive past Beaver Creek Reservoir outside of South Fork, Colorado, go 15 miles up a twisty, gravel, one-lane mountain road for what seems like forever, and try not worry about the thousand-foot dropoffs that could make for a bad day if you aren’t paying attention. At the end of the road is a parking place. You can’t even see the lake. 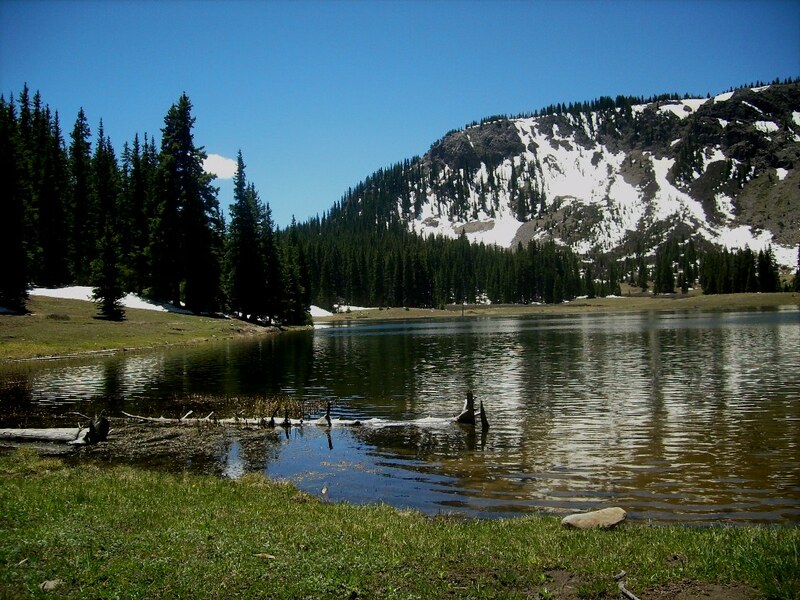 But if you hike through the woods a bit – maybe 10 or 15 minutes – the lake opens up in front of you and it’s then that you notice how still and quiet everything is. Somewhere a stream is running into the lake. Somewhere a woodpecker is notching out a hole in a dead tree. A fish plops out of the water, leaving only ripples behind. But other than those sounds, the area is calm and still. Two fishermen are throwing out their lines on the other side of the lake. A young family with two toddlers are having a picnic. Two fathers and their two sons are fishing off the dam. And then there’s us – mom, dad, brother and sister – trying to walk the trail around the lake, sometimes stepping through knee-deep snow mounds, sometimes fording little streams, sometimes just sitting to relax and catch our breath. I found the carved Aspen tree while we were sitting. Maybe John and Toni were newlyweds. Maybe they were just high school sweethearts. Maybe they’ve gone their separate ways and ended up half way around the world from each other, with different mates, different lives. One thing’s for certain, though. They were in love with each other on this mountain, in front of this lake, way back in ’09. And even if they’ve forgotten about it, the mountains know.